Though I’m not ready for a 3D printer, there are times when I’d love to have custom made printed parts. Is there a reliable company or person that will make them for you? Or a list of such? Another question I often get when I post a design is: “Are you planning on selling this?” My usual answer is that if I did, it would be unreasonably expensive due to the cost of my time, production, and shipping. Having it printed through a service would be less expensive. Since these two questions are asked so frequently, I thought I’d put together a list of options for people who have objects they’d like to print, but don’t have the need or want to invest the money to purchase a printer, or the time needed to learn how to use and maintain one. I get most of my model files through Thingiverse, and that is also where I upload some of my designs to share. It turns out that you can also order prints directly from their website. Each service lets you choose what filament type and color you want to use, the layer thickness, and the infill percentage. When I chose those parameters, I received a quote of $19.59 from Print A Thing, $15.32 from TreatStock, and $19.02 from Ninja Prototype. You’ll notice some other fees, like Startup cost, Shipping, and Transaction fees. 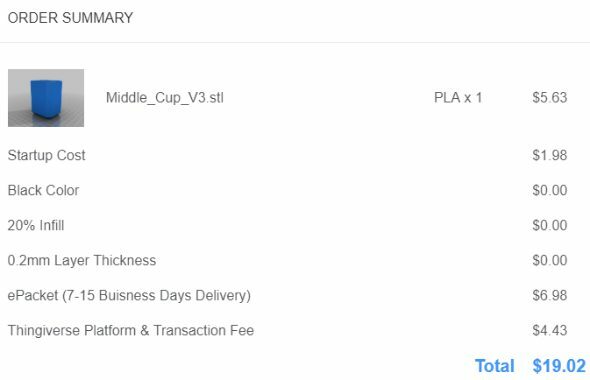 If you print more than one object you should get a better price per piece and that’s just what happened when I tried ordering 4 from Treat Stock, the price only increased to $22.39, making each print cost $5.60. Print a Thing: Print through a distributed network of 3D printing enthusiasts from across the US. TreatStock: Treatstock is an online platform that offers decentralized manufacturing services such as 3D printing and CNC machining for clients all over the world. NinjaPrototype: Direct manufacture with industrial quality. Printed within 48hours & Fast global delivery. There used to be a neat service called 3DHubs that would show you a map of people with 3D printers locally. You could then contract with them to print objects for you. Unfortunately 3DHubs no longer offers this service and now only acts as an online printing service. 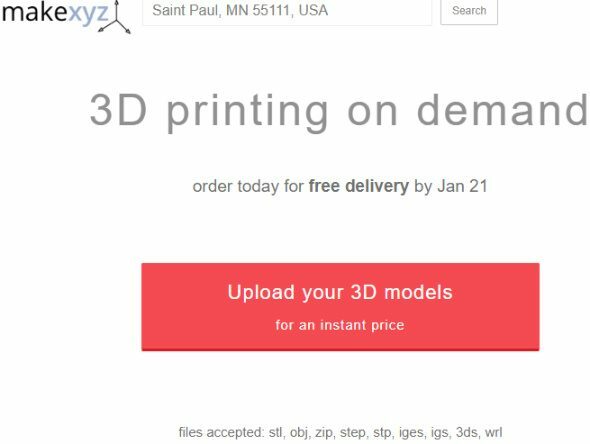 There is another similar service called makexyz, that basically takes your order and farms it out to a local printer. The difference between this service and Print a Thing, is that if you want to choose that local printer yourself, you can go to a special page on their website. Once there you enter your zip code or city and state and it’ll give you a list of local 3D printers. It doesn’t seem to matter if you let makexyz choose the printer, or if you choose your own, the pricing is similar. 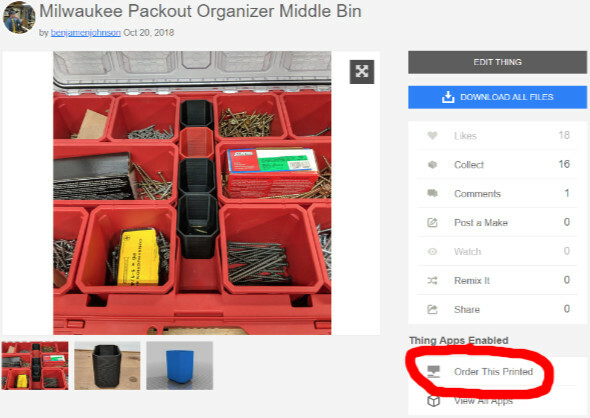 For instance, the same Milwaukee Packout Middle Bin model that I used above was priced at $13.90 delivered. The disadvantage seems to be that if you want to print two, the price almost doubles to $27.35. A public library near you may have a 3D printer available. I found this cool Google Map that shows some of the public, school, academic, and government libraries with 3D printers. There are over 600+ public libraries with 3D printers all over the world. I’m not going to vouch for the accurateness of this map, but for every pin on the map they have a link you can follow. Some of the links I followed were broken, but others lead to sites that I knew had 3D printers. Access rights also vary; you may have to be a resident of a county or a member of a school to use their public equipment. 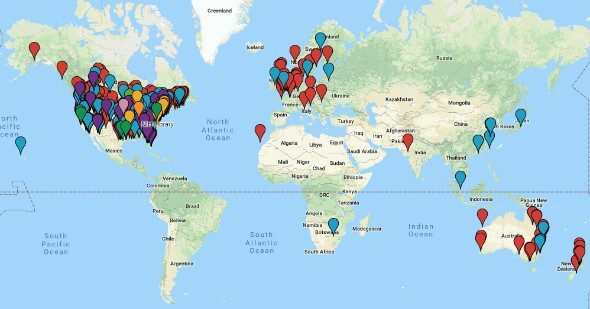 Make offers another interactive world map of Makerspaces, and there’s a good chance that a Makerspace or Hackerspace is going to have a 3D printer. To use a Makerspace, you usually have to be a member. Memberships can range from $50 to $200 a month, with the fees covering things like insurance, rent for the building or space, training, maintenance to equipment, etc. 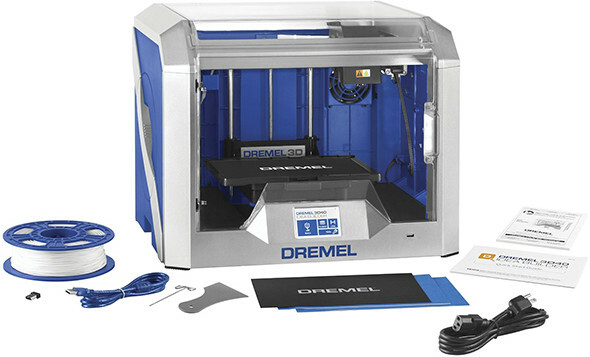 Both my son’s middle school and my daughter’s high school have 3D printers, CNCs, and laser cutters available for the students to use in classes and after school activities. Depending on the school’s policy they may allow students and parents to use these machines for personal use. The rules of usage may vary widely from district to district or even school to school. I’m not recommending knocking on every school’s door to see if they will let you use their equipment, but if you have a prior relationship with a school, it can’t hurt to make a friendly inquiry. If you want to stack the odds, volunteer your time. I haven’t met too many teachers that couldn’t use assistance in one way or another. Did you know a few select UPS stores have 3D printing services? 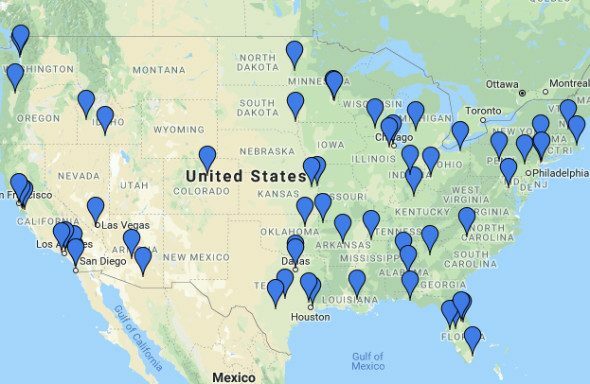 Evidently there are 30 locations in the US that will 3D print objects for you. The map and list of locations they give contradict each other though. For instance, the map says there is a UPS store with 3D printing capability near me while there is no such location on their list, so you probably should call first before going out of your way. A few years ago Staples used to have stores with 3D printing services, but I cannot find a list of there locations anymore. They seem to have replaced the local stores with yet another online 3D printing service. I left this one for last because there are just too many services out there to choose from. Since I don’t have any experience with any of them, I’m not going to recommend one. I’ll leave that exercise up to the reader. Did I miss a major category? Have you had a good experience using an online 3D printing service? Let us know in the comments. Thank you, Benjamin, for putting this together. This is a great resource. Your skull photo reminds of a neat project. 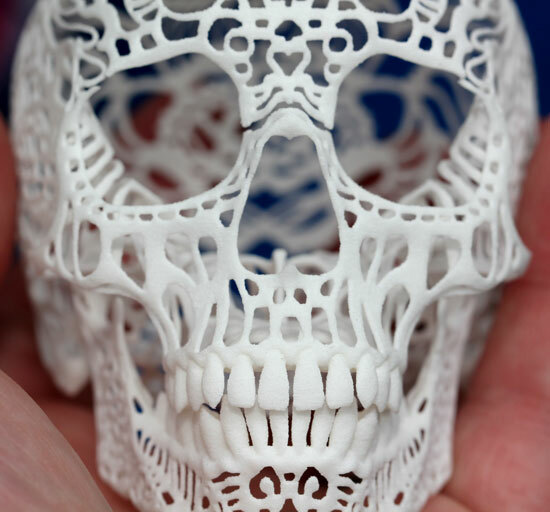 Four years ago, there was a great article in Make: on how to “3D Print Your Medical Scan”. Check it out. Another reason to use a 3D printing service is if you want to print something exotic, which could include: multiple materials, multiple colors, high temperature materials (e.g. PEEK), metals, ceramics, high resolution (e.g. SLS printer). Of course, costs will be higher, but 3D printers that can do most of these things are very expensive. 3D printed zero clearence inserts! Yes! If they are cheaper in multiples, that would be even better. I have used a local school (Digital Harbor) in Baltimore several times and they have done a great job. The kids are happy to be learning about new technology and they always figure it out. Prices are very reasonable and I honestly cannot justify buying a printer when they do such a great job. Dude… Even covers Canada… Don’t take this the wrong way, Ben… I Love You, Brother! Milwaukee Makerspace dues are only $40 per month and has several 3D printers and some expert users. This is a great resource. I’d love to see a similar resource for laser cutting services. Thank you, Benjamen! This is an exceptional resource. Next time I think of something I might want printed, I can go forward with the idea. I’m behind the curve here. I have a Viking range cooktop that had a hard plastic “handle” on the grease trap. This has cracked and the replacement piece is the whole assembly, costing $500! How do I get the broken piece I have modeled to create a new printed piece? Have you done a search for said handle? Do you have the broken part designed in CAD? If so, 3D print services should be able to quote and print one for you. May have to coordinate the file format they need. If the part you are referring to is plastic that cracked off, you may be better off buying something similar and using an epoxy to attach it. If it is attached with hardware something off the shelf that shares the same dimensions may work. I looked into a few of those, but last fall went with my own printer for ~$250 and several hours worth of assembly and troubleshooting said assembly process due to poor assembly at the factory of a few parts and partial instructions … laughing about it in hindsight … been on hiatus with life issues, looking forward to printing and designing some more things. Yesterday I was thinking about how to organize my extra batteries. The other article you wrote about this had something on that, and I looked at that then went on ebay and there was a guy selling them very reasonably for $3-4 with combined shipping for more than one. I’m in the process of ordering several. I’ll let you know how it works out. Without this article I would not have even thought about it, so thanks!